Friday at BlogWalk 1.0 I found myself in the role of facilitator of the first part of the program. We planned the morning as an Open Space event, and though it was planned otherwise, I facilitated it on my own, never having done Open Space before. As I was preparing I took the last meeting of the Medinge Group as an example. I copied some improv games from John Moore, adapted the schedule we used in January, and dived in. Lucky for me Flemming Funch, one of the participants had experience with Open Space and he saved an important moment for me. The improv games at the start were a gamble. I needed them to get everybody out of their chairs, and moving, to energize the room a bit. Up front I wasn’t sure that I myself would be comfortable doing it, as being a participant in these games often feels somewhat awkward to me. But it served it’s purpose. I asked a few people about their experiences, and they thought it worked out ok. Even if for some it felt awkward playing along, and others expected that the games were leading up to making some point, which they didn’t. Maybe I could have made their purpose clearer. A bit more time should have been spent on letting people talk about their goals and expectations, after the short round of conversations. Through that it would have been possible to let them decide on first topics of discussion more easily. I hurried through that, to let them get back to their original conversations. But more importantly, in an effort to explain what I meant by picking up a topic and inviting others to join you in a conversation, I made the mistake of switching roles. As an example I said, ‘I am going to stand here and shout ‘public versus private [spheres in blogging]’ and whoever wants to can join me’. Thus I stepped out of the role as facilitator, and created a vacuum. In stead of making things clearer, as I meant to do, I left the group somewhat confused. Flemming, by asking the right questions let me take up the vacuum I created again, and it went fine from there. 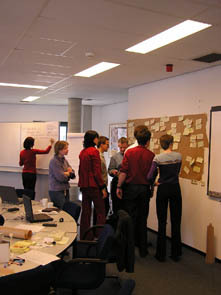 During the rest of morning things went smoothly, though I was a bit worried at first that only a few post-its seemed to emerge from the conversations. It turned out they were just saving them as to have to leave the conversation only once to put the post-its on the wall. When the energy level was starting to drop, I called the group together again, and we started organizing the stuff we created. We ended with a few people explaining what patterns they saw emerge from our output. As a facilitator it was harder to be a full fledged participant, having to think on two tracks at the same time. Because of that I took less home I think from the discussions itself. But then again, I learned a lot from facilitating it. A big thank you to all present! [Addendum] I completely forgot to mention, that I deeply enjoyed facilitating a get together like this. It’s so much more fun, and fit’s me much better, than the enlightened dictatorship one has to excersize when presiding a meeting of some sorts. Our post-it wall, group blog or group wiki? i never do these sorts of games (because i too find the awkward and mostly just a distraction) and never ask for conversation before the opening so we save that opening tension and let it build until it all flows out in the postings… which also takes care of the extra worrying about slow postings. but of course, the beauty is that no matter how you try to dress it up or otherwise “prepare the group” …they always just get on with the work, once the space actually does get opened!